Carlo Ratti Associati is designing a new science campus for the University of Milan, complete with brick facades that will be made by robots. External brickwork on the new buildings will be designed and built with the assistance of robots and include letters and symbols. This facade, say the architects, could be re-arranged into a different configuration at a later date. Italian architect Carlo Ratti's firm is designing the 150,000-square-metre campus, which will accommodate 18,000 students and 2,000 researchers, for Australian developer Lendlease. 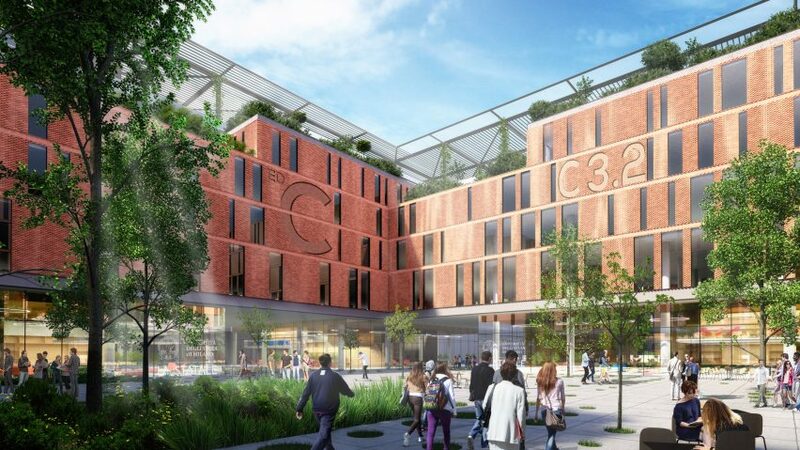 The science campus will be built in the Milan Innovation District, or MIND, the area nine miles northwest of the city, where the Milan 2015 Expo was held. Carlo Ratti Associati has designed the campus to create a new kind of educational environment that references Milan's renaissance-era academic architecture whilst facilitating current learning methods. "However, today Massive Open Online Courses (MOOCs), learning by making, continuous education and so on demand a fundamental rethinking of the architecture of the university – fostering more interactions both inside the community and outside it." The elaborate brickwork cloisters of the Ca'Granda, a 15th century former hospital now occupied by the University of Milan, were a major influence for the new campus layout, which will have five cloisters arranged around a large central square. But rather than separate the university and its students from the city, the campus will be accessible to the public via pedestrian walkways that will cross the site's courtyards. Transparent glazing at street level will allow members of the public to observe the education spaces within, which have been designed to be flexible in order to accommodate collaborative teaching. Along with green spaces in the cloisters and on the rooftops, the campus will include botanical gardens, experimental greenhouses, and a sports field connected to the MIND's park. The district will also the home of the "first neighbourhood in the world" designed to accommodate self-driving cars. Ratti, who teaches at MIT and directs its Senseable City Lab, has also designed a smart road system that could adapt Italy's highways to suit self-driving cars with WiFi enabled poles connected to a fleet of monitoring drones. His practice have also designed a robotic bartender that can mix an infinite variety of cocktails, a modular paving system that can re-zone to suit different uses throughout the day, and a scribbling robot that can turns surfaces into a canvas.